Turkish artist Köken Ergun has made artist’s films of collective rituals before: beauty pageants of Filipino workers in Tel Aviv and lush weddings of Turkish migrants in Germany, all with the same handmade aesthetic and personal viewpoint, captured by a handheld camera in long wavering takes. 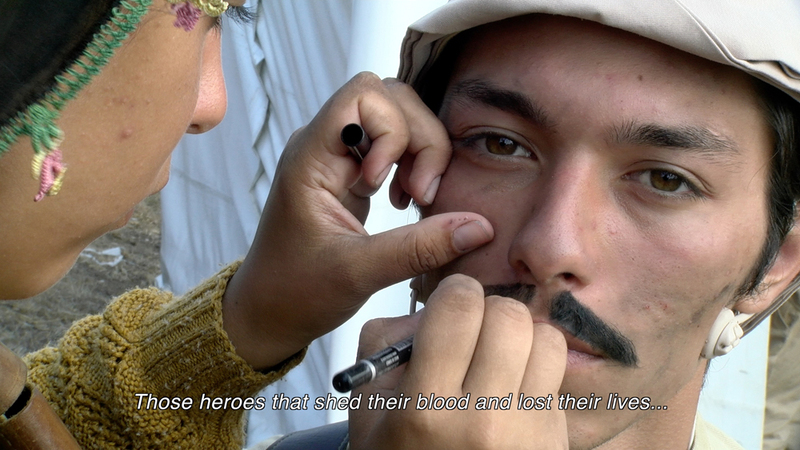 His latest loose, poetic documentary, Heroes (2018), invites us to see how the Battle of Gallipoli, and everything that goes with it, has been narrativised by both sides. Through Gallipoli, the nations of Australia, New Zealand and Turkey are entwined forever, and yet, this single historical moment is not shared. The Battle of Gallipoli, or Çanakkale, also informs Turkey’s national consciousness, but two distinct mythologies—almost alternate histories—have emerged from the Ottoman victory of 1915-16. Armadas of vacationers have replaced armadas of warships, as Turks and Antipodeans descend in yearly droves on the peninsula, each participating in a war-tourism industry peddling vastly different visions of what happened, and re-inscribing the myths of the past in the now. As a feature-length video—a relatively rare form of moving image work, in Australia—co-commissioned by the Australian War Memorial, Heroes elevates place, people and concept over narrative linearity and dramatic tension. 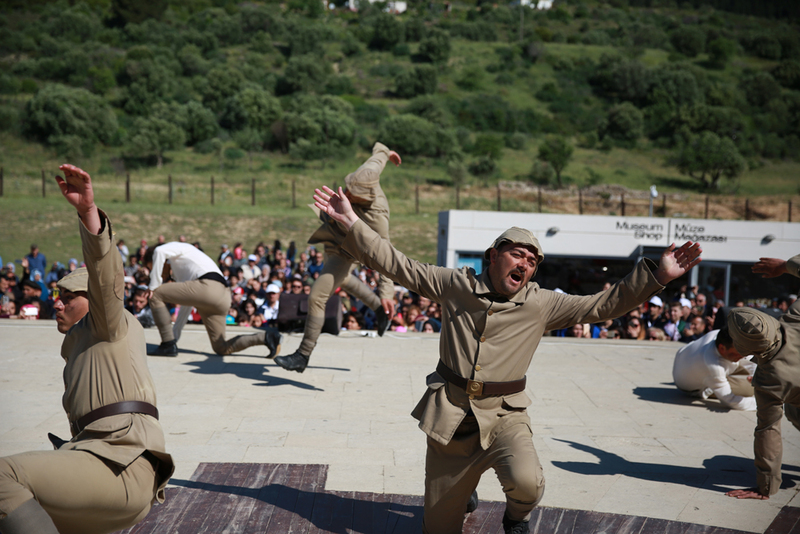 The film’s nerve centre is located within scenes of a genre of Turkish public theatre, which are performed at Gallipoli monuments with agonising sincerity. ‘My nervous heart always fearing sad news,’ cries an actress playing a war wife. Her sweetheart calls back: ‘My entire soul will be thinking of you, I will be with you every moment.’ Their mic’d voices bounce around the limestone acoustics, disembodied by the wind. We see reenactments of the Battle, a dramaturgy of war with a smoke machine and sandbags as props, staged before a line of fluttering Turkish flags. Onlookers weep as a hundred years of national myth-making plays out against the public monuments of the war memorial. Ergun lets the juxtapositions within the frame speak quietly for themselves: sightseers take selfies with statues of the dead, and background shots of the war memorial shop (often seen behind the theatre piece) intimate the imperatives of capital in the war tourism industry. To see your country and its myths from the outside is a strange, powerful experience. ‘They came in order to save their homeland,’ says a Turkish tour guide to his followers. ‘They venerate their ancestors so well….The land is adorned with their graves.’ Shots of individual ANZAC gravestones cut to apocalyptic rows, and the light reaching across the straits of the Dardanelles seems about as hard and clear and bright as Australia’s. ‘Lest we forget,’ chant masses of Australians every year, in a phrase so distant from their usual vernacular, but how exactly do they remember the fallen ‘diggers’? In the moments Ergun turns his camera away from the Turks, we see busloads of bored Aussies wearing reflective sunnies. A seated tour guide reads from her notes: ‘So the reason this area’s called Lone Pine is there was an American song or something that they used to play?’ Much of the commentary she provides lies beyond the realm of possibility—after a century of tides, could shrapnel really still remain in the pebbles of Anzac Cove? Instantaneously, we are a world away from the poetry and fervour of the Turks’ commemorative language, manipulative and mythical in its own way (‘We can’t even call them ‘dead”, says a tearful Turkish tourist). These gulfs and constructs of language form the heart of Ergun’s project: the Turks call their dead martyrs, while the Antipodeans call their soldiers heroes. A line of Turkish school children snake their way past the Anzac memorial and try to make sense of what they see: ‘Foreign language, names of their martyrs, I guess,’ says one schoolboy to another. The same goes for the sculptural forms. The Turks’ public monuments are nobly domed and arched, while the Australian memorial appears as a sandstone replica of the police memorial nearby the Art Gallery of NSW: a rectilinear slab; a squat sideways monolith. A wide-shot follows the rear-end of a hot pink Contiki tour bus: ‘Make every moment count. #noregrets.’ This can hardly be what most war veterans think of when they say ‘lest we forget’. Why does Australia so illustriously commemorate a war it lost? Who are these pilgrims? What are they searching for when they journey to Gallipoli and what value does the war tourism industry bring to their lives? What is really going on at Anzac Cove? Do they feel that the promise of a unique and saleable travel experience, with all the accompanying merchandise (exit through the gift shop), has been delivered? Something deeper than mere patriotism is at work here. In its wandering examination of what Ergun calls a ‘tourism of martyrdom’, Heroes speaks to the ways in which grand narratives manifest in our ideas about ourselves and our families, and the nature of this close identification between ourselves and the fantasies of our nations. Turkey has demarcated 45,000 hectares of the Gallipoli peninsula for Anzac graves and monuments. Would Australia do the same for another country? Australia invaded on another nation’s orders, then built its own monuments in its own language. National entitlement assumes global dimensions, and leads right back to the origin point of the Anzac lie. The feeling that we have, as Heroes’ 88-minute run time accumulates, is one of waste and futility. But Ergun’s ending points to the softly absurd: an Australian military band taps out the swing-feel rhythm of the major key ‘Singing in the Rain’ while Contiki tourists babble in the background. Australia—a country so bereft of its own ideas, its military bands play Hollywood musical standards at international war memorials. All is as it should be.